The Biomedical Communications program at University of Toronto in Canada is a two-year graduate program preparing students for a career in medical and scientific visualization. Combining animation and science as well as being one out of just five accredited programs of its kind, it offers something unique in a field that's growing at the moment and can offer better job security than similar positions in the film and game industry. Stuart Jantzen recently graduated from the program so we asked him a few questions about his time there, as well as how he created his first large scientific visualization in Maya. What was your background before applying and what initially attracted you to the BMC program? Mini life story coming up. From an artistic point of view, I've always enjoyed sketching and being creative. I've also been interested in computer animation for a very long time. I remember trying to make flipbook animations in Hypercard on school Mac computers. I also got into 2D flash animation and claymation in high school. But when I saw one of my friends building a 3D model in a free 3D program called anim8or, it really blew my mind. I couldn't believe you could do full-out 3D computer animation for the low price of zero dollars. I messed around in anim8or for a year or two before discovering Alias Maya Personal Learning Edition (version 6 if you're keeping score at home). That was also around when I joined SimplyMaya. I did some modelling in Maya mostly by experimentation or trial and error. I made a storyboard for a movie that had a Deinonychus skeleton coming to life in a museum (this was long before Night at the Museum) which would morph into a flesh and blood dinosaur in the misty jungles of the Mesozoic era. It was a cool concept, so when it came to production in Maya I eagerly started and ended up with a single claw... with terrible geometry; I recall I accidentally smoothed it and saved, and didn't know how to fix that. So it was all fun and hobby-ish at that time, but after starting at university, my 3D hobby dropped off due to busyness. So backing up a little bit to look at the science perspective, I've always found biology one of the more interesting school subjects, and I did well at it. I did an undergraduate degree in cellular and molecular biology and I really wanted to do something meaningful with that degree, career-wise. But, I couldn't really see myself in the long term working in a laboratory or being a doctor. After graduating, I got the opportunity to work as a bioinformatician. That was an excellent learning experience. Bioinformaticians work with data gathered through biology research: analyzing, processing, interpreting it and fixing the printers for the lab. I used Linux, Windows, and Mac operating systems on a daily basis. I flatter myself by saying I'm fairly OS independent now, although when I encounter an intense concentration of Apple products, I tend to dig in my heels a bit. Learning to code was another computer skill that stands me in good stead today. During that period of working in a lab doing bioinformatics, something in my brain clicked (figuratively) and I realized it was possible to combine my passions for computer animation and biology. But how to educate myself on this interdisciplinary path? I came across the Biomedical Communications program located at the University of Toronto while searching for terms like "molecular animation" and "cellular visualization". The kinds of projects and courses I saw from the program looked perfect for what I wanted to do, namely creating animations about cells and molecules for the purpose of educating various audiences about science. In order to meet the entry requirements, I had to do a fair bit of catch-up with my traditional art skills to put together an application portfolio. And it's no overstatement to say I was completely thrilled when I was accepted into the two year Master's program. What is the student environment and the teachers like? The student environment was (and is) incredibly friendly and close-knit. It was the first time I got to interact with people that had similar combinations of passions and all very talented. When you have a small group of people going through an intense program, it's pretty common to get quite close to each other, so we've all become pretty good friends. The teachers are excellent too. The relationship between students and professors is fairly casual, because the professors are so approachable. I find you often learn a lot more when you're having one on one conversations, and I really valued that. Almost all of the faculty went through the same program, and they have solid science and art backgrounds. At the school we use a combination of iMacs and Mac Pros and the full Adobe Suite, Maya, C4D, and other programs are all available to use; plus Wacom tablets etc. It's pretty well stocked. What is Toronto like as a city and are there any international students in the program? I can't really speak about being an international student; there were only a couple international students in our group, and they had a good experience overall I think, besides the unavoidable administrative hassles. Canada is an excellent country to live in, and Toronto is a good city for students, especially if you can live right downtown, because everything is available and in walking distance. How's the program structured over the two years? I came in with a specific interest in molecular biology, but there is a lot of focus on medical illustration to start out. You start out doing anatomy with first-year medical students including a full cadaver dissection. You also get a primer on some traditional illustration techniques (do some google image searches for carbon dust, unless you're squeamish; it's used primarily for anatomical illustration). Other courses after that involve creation of a digital illustration on some scientific or medical topic. This means you are expected to do the research yourself and fully understand the concepts while you create comprehensive sketches for the piece. I think this teaching approach makes a lot of sense, because in the future, you don't know what sort of content you will have to deal with, so it is better to learn research skills rather than taking a course on histology (e.g.) in the program, and either forgetting it all or never using it. 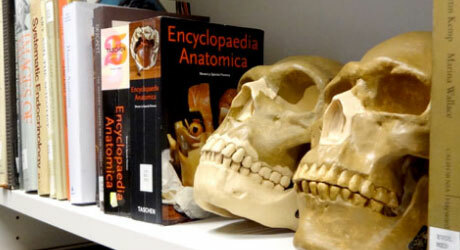 Most of the courses combine art and science. It's a very practical course-based Master's. Some other courses of note include observing surgeries and creating illustrations of the surgical process. Or making a promotional website from scratch (as web technologies change, this course seems evolve more than others). Or creating educational materials for the courtroom in personal injury or forensic cases. The second year is heavily focused on the Master's Research Project (or MRP) where you are working closely with a content expert and your committee to create something. Projects can be pretty varied. Some students make animations, interactive simulators, games, websites, augmented reality combined with physical models. The sky is the limit. This year I believe someone is working with the Leap Motion. Anyway, despite all the technical variety, the technology is really secondary to learning how to effectively communicate science and medicine. You have to know your audience, their education level, their jargon, and how to disseminate information with visuals, audio, and interactive environments. Tell us a bit about the second year Master's Research Project. How did you approach it and what were the main challenges? For my Master's Research Project, I was working with a neuroscientist whose lab developed a tool to investigate brain activity in mice and rats. They wanted to explain how the tool works and the wide variety of applications it can have. Initially I was going to make an animation to explain this, but as I learned more about the intricacies of its functionality, I realized it could be very helpful to create an interactive environment where someone who knows something about the science could play with a simulated version of the tool and understand more how the technology might apply to their own research questions. So I did both an animation in Maya and an interactive simulator in Unity. For the animation, I started with a script and a few images and built that up to a storyboard and narration script. Then I created a 2D animatic in After Effects to nail down the pacing and motion. Then production started, which was pretty much Maya all day every day. For the simulator, I created another storyboard and turned that into an interactive pdf which approximated how a user might navigate through it. Then I had to design the GUI and move onto production in Unity. 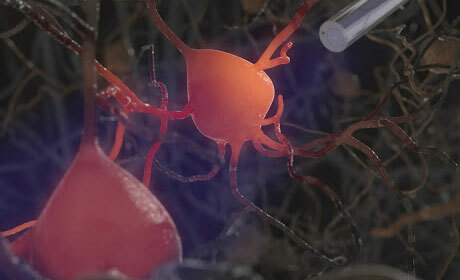 One big challenge for the animation was to create a new visual metaphor for electrical impulses produced by neurons. Typically they are shown as pulses of light traveling along axons (you can see this a lot on youtube). But, in the context of my topic, that would be confusing because there is other information communicated by light emission in the cellular environment. So I had to spend a lot of time thinking about how to visually convey the information. 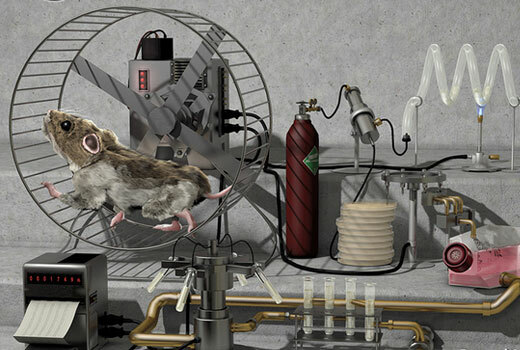 The mouse was a great Maya challenge, in terms of modelling, rigging, animating, and lighting. It is supposed to be a organic realistic living animal, except you can see through it to the brain, so I had to figure out how to make that clear (pun intended) and avoid lots of artifacts and weird stuff. I think in the end it is mostly successful, although there's lots I would change if I started again. For the simulator, there were of course coding challenges and also considerations to be made when designing the interface so it would be intuitive for researchers. And the probe functionality required me to come up with some interesting mathematical formulae that would approximate real-world physics, while emphasizing the ideas I was trying to convey. In short, there were many technical, design, narrative, visual communication, and content challenges. What's been your best experience during your time at the BMC program? It's hard to pick one experience, so I'll disjointedly list some thoughts. As a class, we went to the Toronto Zoo for sketching and photography. I suppose one of my favorite aspects of the program was just being immersed in an environment full of creativity and technical skill. Also, there were a couple of times right in the thick of MRP production, a few colleagues and I would go out to the university on Saturdays and work away at Maya while we watched old Disney and Jim Henson movies. I'm not honestly that productive with those kinds of distractions, but it's a good memory. On a different note, I don't know quite how to describe it, but I was quite unprepared for the intimacy (for lack of a better word) with which you experience the cadavers and just the human body. Things like holding a human heart or meticulously dissecting to reveal the incredibly delicate muscles of the eye. I'll never forget those moments; it's not something you can take lightly. I guess overall, there's such a wonderful variety of things to experience and learn. I'm really not doing this interview as a promotional thing as much as it might sound like it; I just am continually struck by how many different things I got to dive into. What are the most important things you've learned from studying at this program that would perhaps be difficult to learn by yourself or elsewhere, and was there something you knew before starting that you feel has been an advantage? Honestly, I don't think the most important thing would be learning the technology; in fact with the available resources on the net, it's fairly straightforward to go about learning any number of software tools (I won't say easy or fast). What I would say is more important is the development of visual communication skills. How to organize concepts and direct your audience through a piece for maximum effect. Peer-feedback is also really good for that kind of learning, which is most effective in a face-to-face setting. Before entering the program, through previous work and learning Maya, I feel like I developed fairly good troubleshooting and problem-solving habits and strategies. That helped me out a lot. I feel it's more important to know how to approach problems (including how to get good responses from forums) rather than knowing a long list of solutions. That applies to creative problem solving too, which I see as different from troubleshooting. With troubleshooting, something has gone wrong and you need to fix it; with creative problem solving, you have to figure out how to show cells fusing or how to show the vibration of atoms in the context of a cellular process. Or how to elegantly model a complex mechanical object, if that's more your field. What happens now when you've finished the program and what's your view on future career prospects? The program is excellent about helping with job placement. After we finish our research projects, there is an "Industry Day" like a kind of job fair where each student has a computer station at school to show off their work. Representatives from many studios, hospitals, firms, etc. come to check everything out, interview, and look for potential employees. Sometimes they are not hiring and are just keeping up on who is entering the professional world, but that networking opportunity often results in jobs. We are also kept up to date via email with job postings for contract work or smaller projects. The job placement overall seems to be pretty good, although maybe not as good as in previous years? It's always tough to know where exactly the industry is going, but I'm quite confident it will continue to be in the upward direction for the foreseeable future. Many people stay in Toronto, because it's got quite a concentration of people in our field. I had to make the decision as to whether I wanted to be at a studio or continue with more academic pursuits. I chose the latter and have actually started work at the same university/department with a former professor. I'm not doing a PhD, to be clear, I'm working as a research assistant/associate. My supervisor and I are doing research on science education using molecular visualizations, so I will be creating animations, interactive pieces, administering tests with eye-tracking software; basically doing lots of different things. The best part of this field is you always can learn something new and create something new. More information about the Biomedical Communications program at the University of Toronto can be found here. Stuart can be contacted through his website here.